It could be said that New Eden’s most important citizens are the most looked down upon, and most disdained. While performing some vitally important services and creating thriving economies, industrialists clamber on about their work, knowing that their choice of gameplay helps fulfil a vital part of Eve. While it can be said that these players are the most spreadsheet making addicts in any MMO, it’s more than just a desire to strain Excel to it’s breaking point that drives people who choose to make their lives in industry. 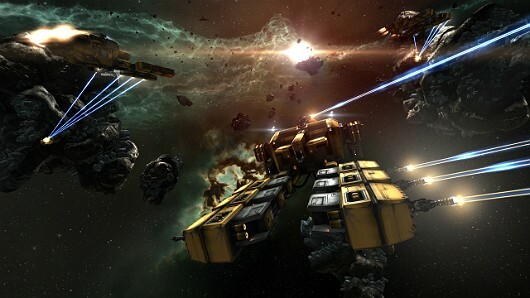 In this three-part series, we’re going to take a deeper look into the reasons why industry is the most misunderstood part of Eve Online. Certainly being boring can pertain to any aspect of Eve. Have you ever been out on a PvP roam for hours on end and come up with nothing but a shuttle kill? Have you ever been on a structure shoot with half as many people attending as there is in fleet? Have you ever been stuck in ten percent tidi waiting for an hour to get through traffic control then ten minutes before your large guns shoot something? Have you ever… well, you get the point. But even when all of this takes place, most of the “PvP elite” still stand by the fact that they’d rather put up with the above challenges than watch mining lasers spin their ballet across asteroids. Fine. I certainly don’t begrudge the excitement of shooting at a stationary target like a station. I have nothing but admiration who make jump after jump trying to find just one thing to kill. And I strain to withhold my giddiness when a pilot flies by that just waited in traffic control for thirty minutes to jump in system. Boredom is in the eyes of the beholder. 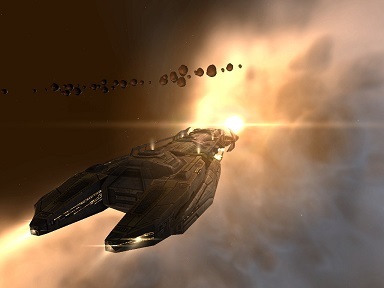 There are numerous activities in Eve that are boring; so much in fact, that we’ve created a “cure” called ship spinning. If you’re not into all of the facets of the game, you eventually burn out. This was a subject of much discussion during the CSM Winter Session regarding player retention. Being PvP-centric, the players who fight it out tend to look upon industry as a necessary evil only because ships, modules, and guns aren’t generated by the game and fully stocked at regular, stable prices. No, the vast majority of players don’t delve into the industrial side of the game which I think is an ironic tragedy because one man’s boredom is another man’s opportunity. While you’re trapped in station and looking at chat boxes, I’m checking my manufacturing, invention, and research queues region-wide. My market orders are generating passive income while I’m out losing ships at an alarming and glorious rate. You want real satisfaction? Buy a few blueprints, mine your own minerals, build a ship from the ground up (modules, rigs, and all) then kill someone with it. Seriously. I know that it’s the same kill statistically whether you build the ship or buy it (mining means minerals are free, right? /sarcasm). But putting in ALL the effort from the bottom up gives me more satisfation and connection with the ships I fly. The difference is I can still go out and PvP while things lie in the cooker and I always have ships to fly in. Logistics, EWAR, combat, exploration and haulers… I’ve got fleet needs covered and the kills or losses have more meaning to me. No, I don’t make all the T2 materials to be able to do the same thing with those ships, but I feel taking all the steps to go through what it takes to build and fly ships gives me more of that experience of immersion that makes the game that much more fulfilling. I realize that it’s a time sink that not everyone wants to undertake, much less skill for. If you have an alt, I highly encourage you to at least train up an industrial character if you’re wanting to take your gameplay experience up another notch. 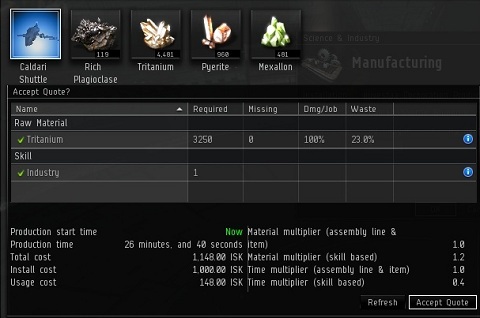 Rather than be one of the people in nullsec who are waiting for their logistical corporations to supply ships and modules, do something about it. I usually carry a couple BPCs with me while I’m down in a deployment area so I can at least put some guns or frigates up for contract for the alliance without having to worry about another industrialist buying my whole supply and tripling the price to leech off the needs of the mission. In it’s own way I agree with a lot of the detractors: The manufacturing interface is too cumbersome, the inventory system is a mess, punching rocks can be boring without corp mates and alcohol, planetary interaction is a clickfest of gigantic proportions, the markets are full of bots, the POS management requirements can be confusing, and managing all of these can be daunting. We’re hoping to see some big improvements in these areas from future releases. So by no means am I saying that industry is a lilly-covered field full of unicorns and rainbows. What I am saying is that wading through all of the challenges thus far has made this side of the game of micro management something that I can actually enjoy. Since I don’t get a lot of time to log into the game, it gives me an area to engage my mind and focus. I can make production plans and even try out a new ship before I sell them off on the market. If you’re on the brink of burnout, I’d highly encourage you to grab a frosty beverage of your choice, turn on the tunes, and punch some rocks on one screen while visiting on Teamspeak or Mumble playing the game of your choice on the other screen. It doesn’t take a lot of time to just fill an alt with a few million isk and dabble in the markets. Although planetary interaction is a scaled down version of Farmville, it’s worth the tedium and doesn’t take very long at all once you get your setups going. At the worst case, throw some dang frigates or something on contracts to help the corp out. There are holes that need to be filled and the efforts of one person supplying the tools of war in one location can have butterfly-effect results. Then again, industry is boring. None of you should mine minerals and drive down my market with more supply. There’s no way in your right mind that you should build your own ships because you should be buying from me. Finally, there’s absolutely no reason why you should generate your own passive income through planetary interaction or market orders. Nope, not one. I’m perfectly content to let the mob mentality of “industry is boring so I don’t do it” have its sway and keep others from infringing on my market while I’m out getting killed in a big ball of fire. I like the fact that it takes a detail oriented person to be successful at industry. It keeps scrubs like you from making money and keeps your isk PLEXing my account(s). Now that we’ve admitted how boring industry is and what kind of awesome, elite, and chosen people it takes to do it, next week’s article will go into the current state of industry in all the different sectors of the game and the challenges they present. In part three, we’ll finally get into what it takes for industrialists to create their own opportunities and some potentially controversial ways to rethink how the nullsec community views industry in their areas. I hope you’ll join us then.